The latest higher education enrolment statistics from the UK will do nothing to calm the debate over immigration and internationalisation policies in the country. The numbers for 2014/15 were released on 14 January 2016 by the Higher Education Statistics Agency (HESA) and they reflect a number of troubling trends. Total enrolment at British higher education providers fell by 1% between 2013/14 and 2014/15; undergraduate enrolment and part-time student numbers fell by 2% and 6% respectively. While the total number of non-EU enrolment was essentially flat in 2014/15 – rising only 1% over the year before – the number of first-year students from outside the EU fell by 3%. These findings are thrown into even sharper relief when we consider the wider context. 2014/15 marked a second consecutive year of tepid growth for non-EU enrolment in the UK. Non-EU enrolment grew by 3% in 2013/14, but only after having fallen the year before for the first time in nearly 30 years. Further, the decline in non-EU commencements in the UK reflects an eroding enrolment base that will place additional pressure on overall student numbers in the coming years. Perhaps most notably, these flat or declining enrolment figures in the UK appear in sharp contrast to the strong growth recorded by other leading destinations. The number of international students enrolled in US higher education, for example, grew by 10% in 2014/15 – marking the ninth consecutive year of enrolment growth for the US and the biggest year-over-year jump in 35 years. In a similar vein, Canada’s foreign student numbers are up 83% since 2008 and by 10% between 2013 and 2014 alone. Australia and New Zealand have also booked solid double-digit growth over the last two years. The importance of Mr Slaven’s call lies in another key point for British educators: non-EU enrolment growth, however modest, remains an important counter to overall downward trends in the UK’s higher education enrolment. It was not long ago – 2010/11 – that British higher education institutions enrolled their highest-ever number of students: 2,501,295. But a lot can change in three years. Enrolments have fallen every year since, and a big source of the decline has been a decrease in undergraduate enrolments: in 2012/13 domestic undergraduate enrolments fell by 18%. This downward trend moderated in 2013/14 with an overall decrease of 2% (led by a 2% drop in undergraduate numbers). But even so, this, in combination with the latest HESA figures for 2014/15, means that total higher education enrolment in the UK has now steadily declined over the past five years. As the following chart reflects, the overall decline in first-year, non-EU enrolment for 2014/15 was led by some of the world’s most important emerging markets. Year-over-year numbers from India and Nigeria were down 10% and 8% respectively. All told, six of the top ten non-EU source countries for UK HEIs declined in 2014/15. Source markets outside the top ten – indicated as “all other” in the chart below – were also down by 4% year-over-year. Along the way, the US displaced India as the second-largest non-EU source market for British higher education, on the strength of both India’s double-digit decline and a 1% increase in American enrolment in the UK. 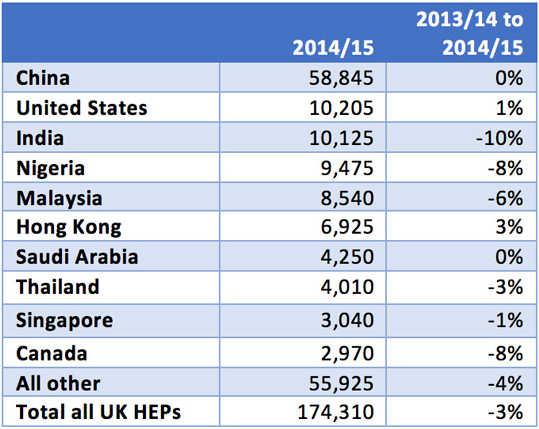 On a bright note, China remains by far the UK’s leading source of non-EU students and, while Chinese student numbers did not increase in 2014/15, they were stable in relation to 2013/14 (0% change year-over-year). The latest non-EU enrolment figures for the UK will no doubt spark further discussion as to how to align government policy – particularly in the areas of net migration targets and work rights for foreign students – with the government’s stated aims to strengthen Britain’s competitive position as one of the world’s leading study destinations. The apparent tension between the two policy directions was well illustrated last summer when Minister for Universities and Science Jo Johnson announced the government’s commitment to increasing overall education exports from £18 billion in 2012 to £30 billion by 2020. This entry was posted in Europe, Higher Education, Most Popular, Regions, United Kingdom and tagged higher education statistics, undergraduate student recruitment, universities with international students, tertiary education overseas, colleges with international students.